When you’re whizzing through four US states in less than a week, it’s fair to say that you’re going to see a lot, and that you’re not necessarily going to remember every tiny detail. This is how I felt after a whistle-stop tour of Louisiana, Mississippi, Alabama and the Gulf Coast of Florida. I’d seen and done so much in such a short space of time, that my brain couldn’t quite compute. My stomach didn’t have any problem digesting all that I’d eaten though. In fact, it can recall every delicious meal and drink that passed my lips on the trip. And there were many. 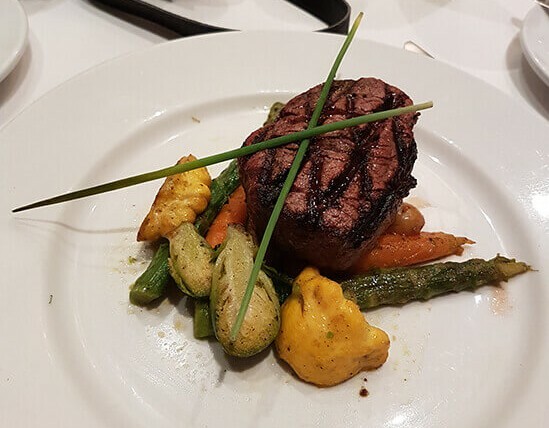 I’d heard a lot about the delicious seafood in New Orleans and, while there was plenty to be had at the Hotel Monteleone – famed for its rotating carousel bar – I didn’t regret opting for the beef. Sumptuous, juicy and cooked to medium-rare perfection, it was easily one of the best steaks I’ve ever tasted. And all in a great setting too; the luxurious Hotel Monteleone, on the edge of the French Quarter, is one of the most historic spots in the city; not to mention one of the last great family-owned and operated hotels. 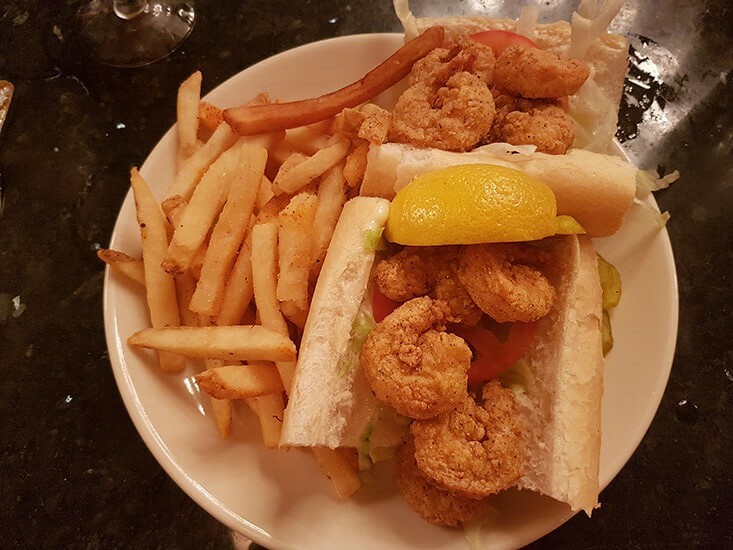 The soft, fluffy bread of the po’ boy set off the crunchy, deep-fried shrimp perfectly – within seconds of my first chew I realised what all the fuss was about. I couldn’t quite manage every morsel of this traditional New Orleans sandwich, but I relished every pack-a-punch bite, soaked with the tang of Louisiana hot sauce. Don’t expect to finish the whole lot, maybe even find a friend to share with, but whatever you do, don’t leave without trying this quintessential dish. 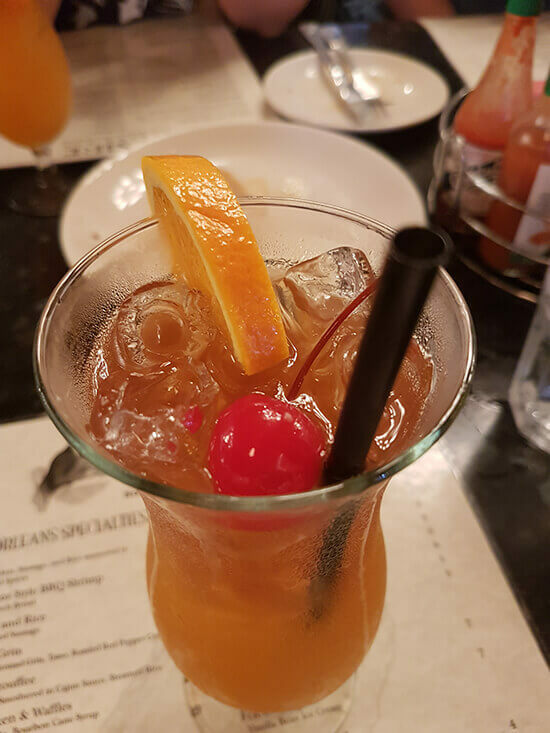 Served with a side of live jazz music, the Hurricane is one of New Orleans’s most beloved cocktails. A few sips in and it’s easy to see how it earnt its moniker – light rum, dark rum, fruit juice and grenadine, swirled together in copious quantity, make this a deadly yet flavoursome drink of choice. A must-try. Intense and sugary sweet, beignets encompass the flavour of New Orleans. 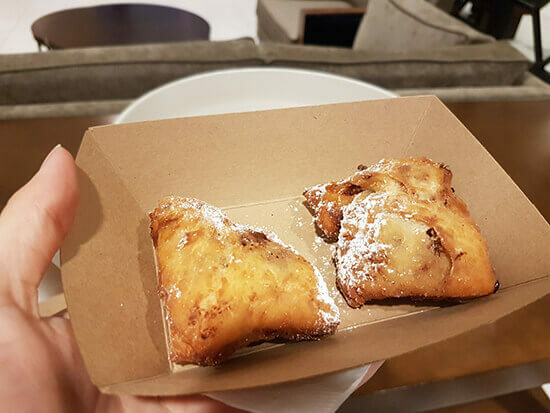 Inspired by the French dish of the same name, these deep-fried pastries are a true guilty pleasure. And the chocolate-chip version of the fritters we were given at the DoubleTree by Hilton Hotel were no exception. They were warm, melty and utterly delightful. If it’s possible, I think I even preferred them to standard doughnuts, thanks to their light and fluffy texture. It takes a lot to beat fresh catch, especially when you’re in a town located on the Gulf of Mexico. 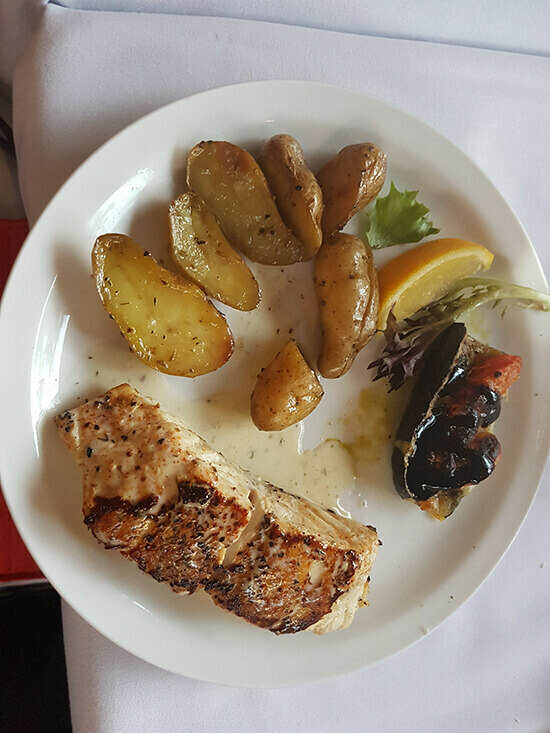 Flaky, tender and flavoursome – without being overpoweringly fishy – the red snapper at the elegant Maison De Lu restaurant certainly lived up to expectation. And if that’s not enough, it’s worth noting that the restaurant is blessed with a beautiful courtyard setting, illuminated with twinkling fairy lights and exuding a relaxed atmosphere after dark. Perhaps a bold statement, but fish tacos don’t get much tastier than this. While Wintzell’s may be known for its oysters (and even I admit the baked varieties we tried here were extraordinarily tasty), it’s the blackened fish in tortillas that really stood out for me. Cooked with just the right level of spice, the fish is topped with Pico de Gallo (fresh, Mexican salsa), purple cabbage and a squirt of lime. It needs nothing more; the flavours are balanced faultlessly. And you get three of the floury tacos, not to mention a side of fries (or sweet potato fries), so there’s plenty to keep you going for lunch or dinner. That said, if you’re still hungry, be sure to order a side of the fried crab claws too. Eating a soft-shell crab for the first time can be a bit unnerving. “Do you eat the whole thing?” one of my travelling companions queried. But I’d had the delight of this dish before, so with confidence I told him ‘yes’ and offered him a leg to try. 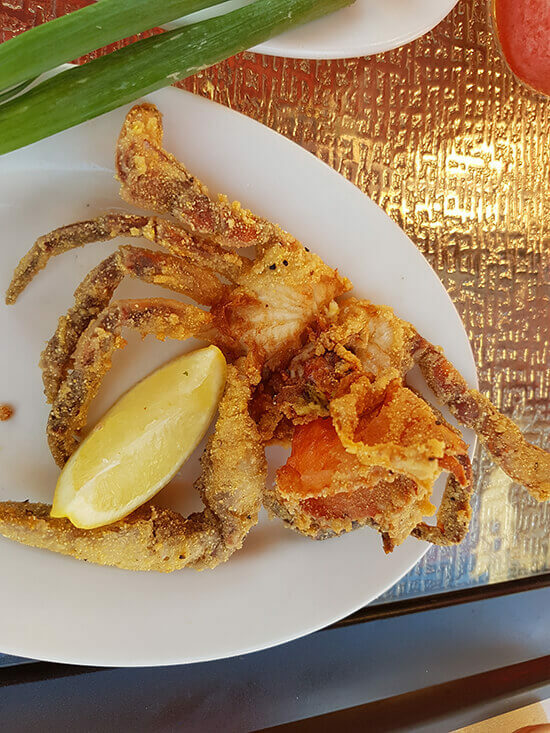 It may be difficult to get your head around, but every part of the soft-shell crab, from the head to the body, is all for consumption and all equally tasty – this one was no exception. The tempura was light and the crab meat fresh. 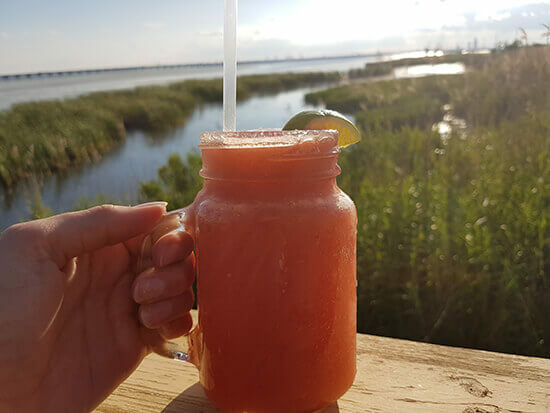 With the heat beating down on us, there seemed no better way to follow up my soft-shell crab than with a frozen strawberry Daiquiri. No manufactured flavours here – this delectable cocktail tasted just like blended fruit, with a dash of rum and ice of course. Even before you taste the food at Pelican’s, the view fills you up. Perched on the end of a jetty that juts out into Panama City Beach’s Bay Point, it’s perfect for sun-drenched afternoons, soaking up the classically flawless Floridian weather. 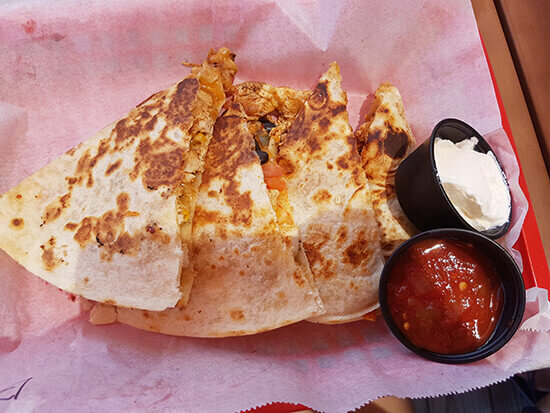 I opted for a Mexican-style dish again: quesadillas packed with blackened chicken, melted cheddar and jack cheese, and black beans, served with a hearty helping of Pico de Gallo and sour cream. It was a divine lunch to accompany some divine vistas. 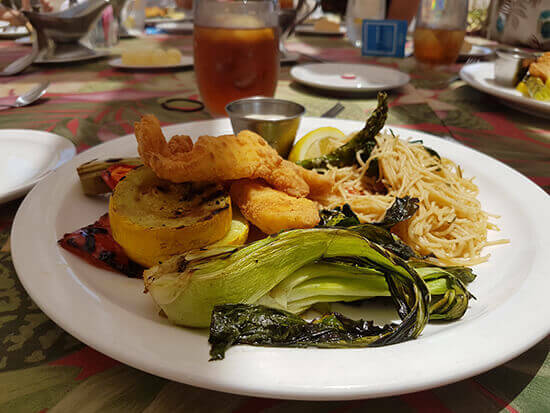 Lionfish is something of a rarity when you compare it to the type of fish that usually makes its way to your plate – think salmon, cod or sea bass. But the Hilton’s Chef Dan Dunn is changing that. The lionfish population around Pensacola and Mobile has boomed to an out of control level, with these predators hunting local fish like grouper and snapper so much that they’re being pushed out of their natural habitats. To combat this, Dan and a handful of other chefs in the Pensacola area are helping with a programme to control the lionfish population by, well, cooking them. Actually, coating them in batter to be precise. And the results are pretty tasty. 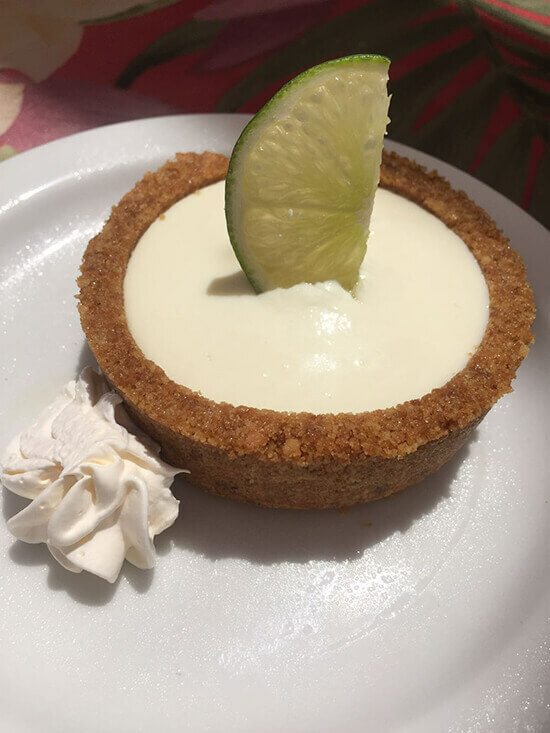 It’d be rude to visit Florida and not try a slice of Key lime pie or, in this case, my own individual pie. Much to my frustration, after a filling lunch I could only manage half, but I savoured every mouthful of this sour-sweet dessert, which simultaneously gave me a sugar boost and cleansed my palate… ready for the next intake of food. 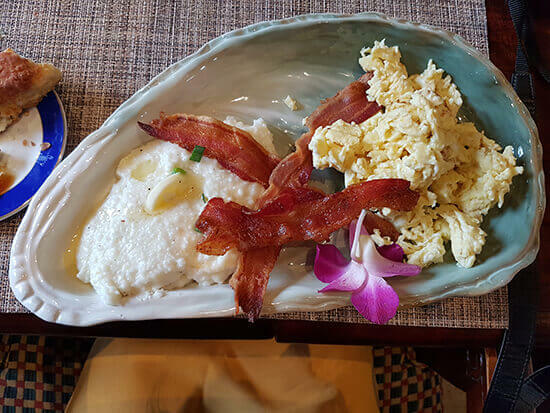 Sample some great grub on our Rhythms of the South itinerary – chat to a Travel Expert to find out more about tailor making your USA holiday to be as food-focused as possible.